The S.S. Lazurus (get it?) is picking up some graduating seniors at Crystal Lake, when it accidentally drags a power line over the corpse of Jason. For the second time electricity resurrects Jason, and he hides on the ship. Thankfully, someone has a spare hockey mask on board which he avails himself of after killing them. He hides on board and begins surreptitiously killing people off, at least until his discovery ends up sinking the ship. The survivors take a lifeboat to Manhattan, with Jason in hot (well, hot for Jason anyway) pursuit. Jason Takes Manhattan is the bottom of the barrel for the series, it's dull, uninspired looking, and virtually bloodless. Worst of all it wastes a fun premise by spending the majority of the film on a boat. 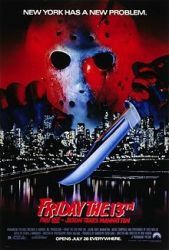 There is a noticeable upswing in the movie's energy once it bothers to get ashore in New York, but the idea of Jason interacting with various elements of the city are barely capitalized on at all. The final chase through the sewers hinges on the idea that New York floods its sewers with toxic waste, and there has been much made of out the nonsensical ending where Jason is turned back into a child. I really didn't find it that much more ridiculous than Jason or his mother popping out Crystal Lake. Jason Takes Manhattan is a failure on nearly every level, its one saving grace is having the single best trailer out of the entire series. It also has Jason killing with a pink flying V guitar, which is strangely awesome in it's horrifying lameness.